People were horrified last week when the curtain on a San Antonio stage collapsed as a presidential candidate, Carly Fiorina, was speaking. While some might see that curtain malfunction as a reminder that supposedly reliable structures (or special interests) can topple, I was struck by Carly’s first reaction: She asked if everyone was OK. It was further proof of her concern for others and her steadiness in the midst of crisis. According to polls I’ve seen, some 70 percent of the American public says our country is on the wrong track. There is broad consensus that we need inspired leadership to restore our nation’s economic vitality, stability and safety from international threats. I agree wholeheartedly and I think our next chief executive needs some very specific talents and skills. Americans are tired of political leaders who shade the truth, hide their actions and snare us in a maze of rules and regulations. They want a leader who is committed to transparency with the courage to keep telling the truth. That’s Carly, a straight talker. After nearly seven years of a smooth talker in the White House whose decisions and actions have fallen short of his promises, Americans are ready for leadership from a president who will be able to make tough decisions after careful deliberation and then see them through. That takes real leadership and that is definitely Carly. Americans are a generally optimistic people whose high hopes for the future are based on our nation’s incredible track record of creating opportunity and rewarding hard work. Unfortunately, folks who lean Democrat are currently flocking to Bernie Sanders, an avowed socialist who touts a a single path to redemption: more government handouts. Hillary Clinton, currently polling in first place for Democrats, expresses much the same domestic agenda. When Americans of both parties stop criticizing this amazing country and its strong and determined people and reconnect with our country’s essential greatness, Carly will be there for them. We realize the world around us is not hospitable to our nation’s core values of freedom, individual rights and equal treatment under the law. Whether it’s cyber attacks from Asia, another beheading video from ISIS or our fraying relationships with longtime allies, threats from bad actors around the globe are only growing. Americans need someone well versed in global issues and pragmatic relations with America’s allies and enemies. With her experience interacting with national and international business and government leaders, Carly understands the importance of a strong American presence as a deterrent to further harm in our rapidly changing world. Americans would welcome a president who will honor the Founding Fathers’ vision of a balanced system of government. Over the past two terms, the balance of power in Washington has shifted significantly to the executive branch. Having been born in Texas with a law professor father, Carly grew up in a home where dinner table conversations were frequently about the size and scope of government. If Americans are ready to restore the nation’s original structure of checks and balances, Carly is their candidate. Finally, Americans want a leader who will tell them the truth about our country. At the most recent debate, she and her fellow candidates sparred over numerous topics, but I was struck by the simple and eloquent definition of leadership Carly offered: “The highest calling of leadership is to challenge the status quo and unlock the potential of others.” Just think about this message — this is both extraordinarily refreshing and true! America needs to be leading once again. It is time to put our country back on the right track, unlock the massive potential of our citizenry and regain our rightful place as a trusted, principled global leader with a passion for freedom. 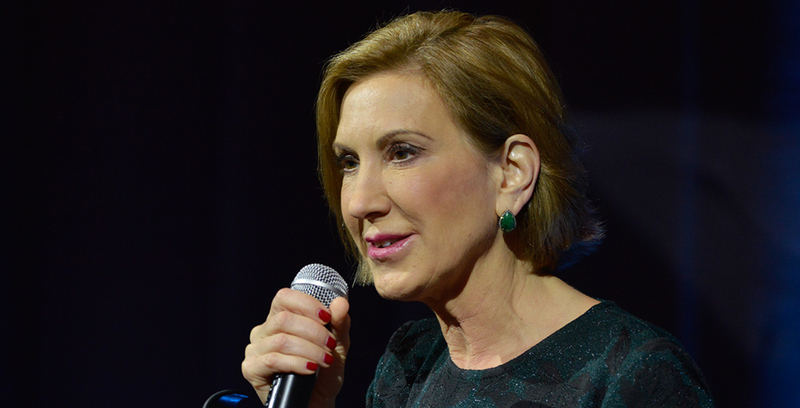 I believe Carly Fiorina is the right choice to lead that turnaround and I hope you will too.